I do enjoy going to protests that go right. And shutting down a Vodafone store last Saturday went very well. In the same week that George Osborne announced to great applause from his back-benches the removal of £7 billion from benefits and the destruction of the welfare state, HMRC quietly dropped its attempts to force Vodafone to pay their outstanding tax bill of £6 billion. BILLION. £6,000,000,000. So at a time when George Osborne was commending his review to the House, which will result in deaths of hundreds, the destitution of thousands and the displacement of hundreds of thousands, as “bringing Britain back from the brink of bankruptcy”, Vodafone was forgiven a tax bill that would have rendered those cuts to welfare completely unnecessary. Why? I couldn’t possibly speculate. 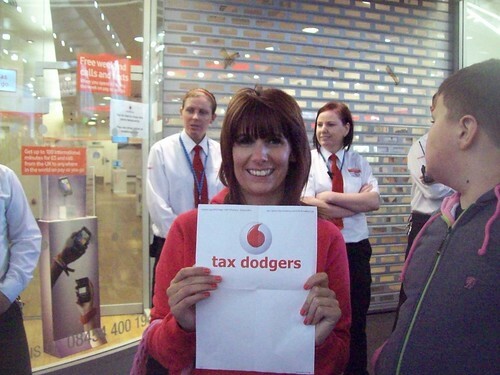 I merely note that John Connors, a former senior official at Her Majesty’s Revenue and Customs, moved to become Head of Tax for Vodafone in 2007, and since 2010 has been George Osborne’s adviser on corporation tax. I believe that such things in the third world are known as “corruption”, but of course such things never happen in 21st Century Britain. LOL. Of course they happen, and have happened. Fortunately this story has been sufficiently outrageous that even the average British citizen can’t quite believe that Vodafone has got away with paying the same amount from their profit margin that is now being taken from the hands of people who desperately need it in the name of “dealing with debt”. 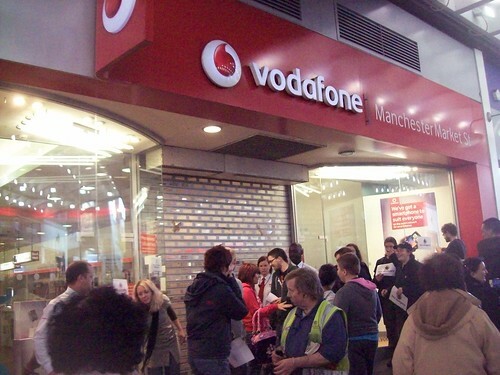 Spontaneous protesters shut down the flagship Vodafone store on Oxford Street last week and there was a subsequent call for sit-ins across the country at Vodafone stores last Saturday, the busiest shopping day of the week. 21 stores were shut down in places as diverse as London, Oxford, Worthing, Leeds, Sheffield, Edinburgh, Glasgow, and of course, Manchester. Vodafone do our work for us and shut the shop. Given that the Manchester demo was organised at 9pm the night before, we managed a pretty respectable turnout. The Vodafone store had obviously had prior warning and was already closed and shuttered – but we still stood outside it for 4 hours, chanting and leafleting. The response from the public has been overwhelmingly positive: most were horrified at the amount of money involved and thanks us for demonstrating, several asked me what they could do to get involved, others announced they were going to switch from Vodafone immediately, and one or two spontaneously joined the protest. Sadly, we also had to deal with an Arndale security staff member who told us we were “pathetic” and “sad”, and that she didn’t care about the cuts because she had a “job for life” because “there are four things which are certain in life, death, taxes, food and securing a building”: I would add that another thing that is certain in life is “your line manager receiving a complaint letter if you are a obnoxious moron to me”. But besides that, it was a good day. It was, however, an isolated protest. 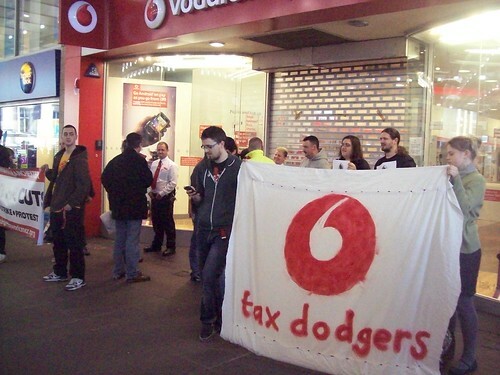 Vodafone’s tax dodge has cost us £6 billion, but as I heard Graham Turner say at the Education Action Network the day after, Vodafone is only one company. Every billion the multinationals save from legal loopholes and negotiations with the government to cancel their debts is another billion stolen from the public services that are used and needed by all of us. George Osborne’s “reforms” are going to effectively fire 1 million people, who won’t be able to access the benefits they need to support themselves because he’s removed those as well. If you don’t want to be one of them, I suggest you start organising. Previous post: Why the Coalition is Going to Kill People Part 4: Other Parties Helped Them!